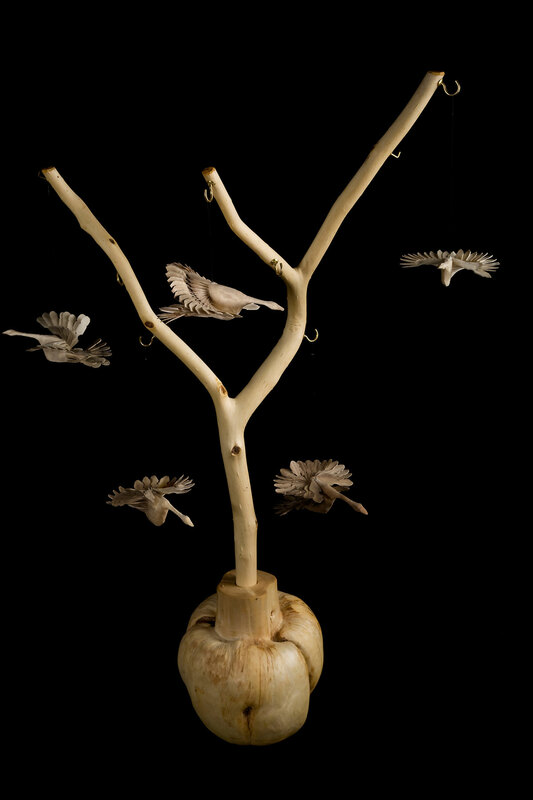 Flock of Scandinavian fanbirds and detail of one. 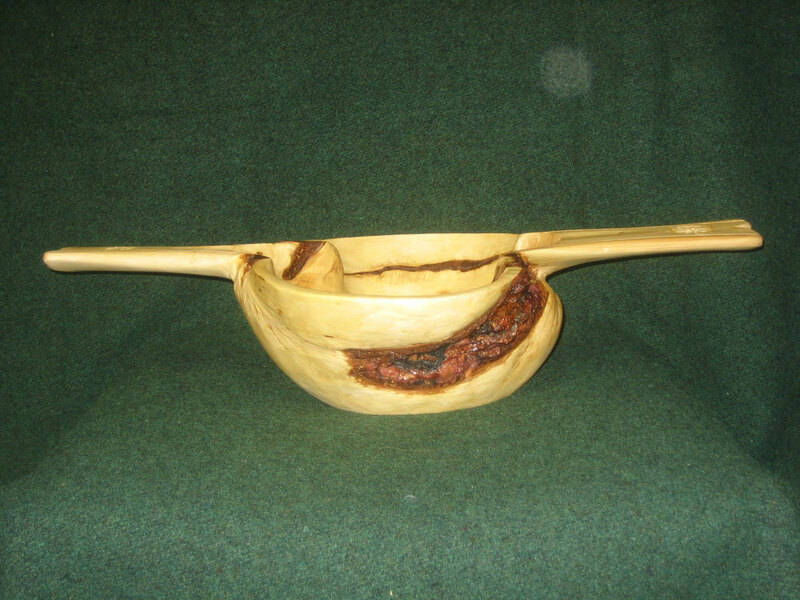 Traditional folkcraft throughout Eastern Europe made from a single piece of green aspen. Aspen, 6"L x 2"H x 5"D, 12/2010. Castor's Cask. Beaver (hence "Castor")- chewed aspen (strangely on both ends) from the banks of the Chatanika River. Low-relief carving of a beaver head on top of this little hinged box with brass fittings. 11"L x 6"W x 5.5" H; aspen; April 2010. "Whoo's Hoome?" Toy. 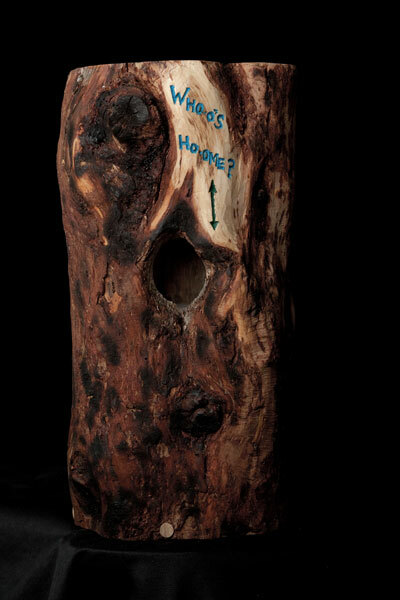 Fire-killed black spruce with a flicker hole serving as a portal for the carved and painted boreal owl that slides in and out of sight on a spline. 13"H x 6.5" Dia; black and white spruce; May 2010. Large Norwegian Shrinkbox with vertically hinged lid. A Scotch pine (Les' # 13) was harvested, hollowed out, debarked, washed and then grooved in the base to accept a dry bottom. 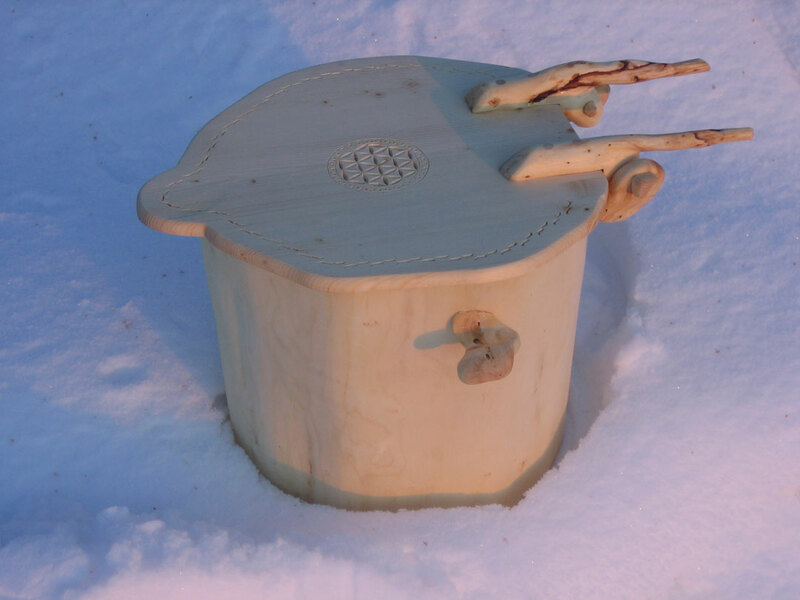 The green wood cylinder with sealed endgrain seasoned and shrank for a winter (hence a "shrinkbox)onto the dry base to make this traditional style of container used for food storage. The lid hinges vertically in a sectioned black spruce burl ("lollipop" hinge). 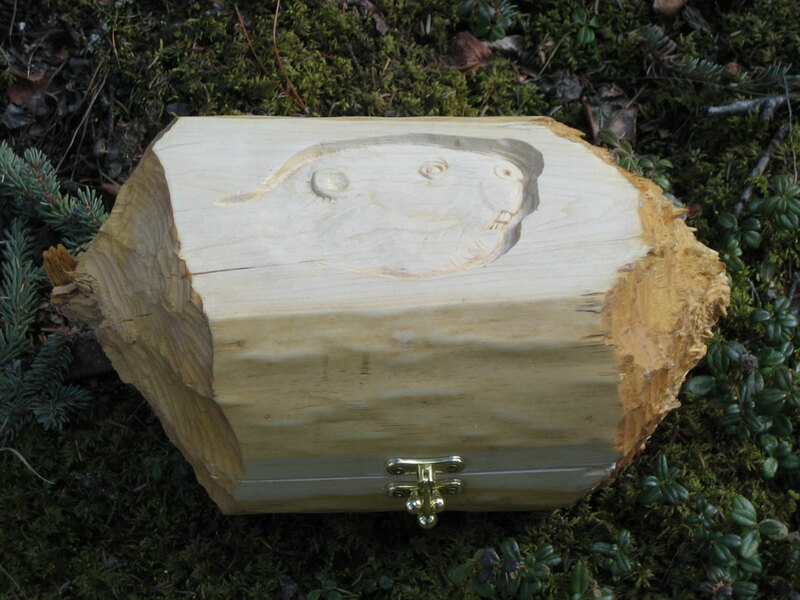 The lid is secured in place by two shaped black spruce burls (they also double as side handles) that pin into burl rings. A Swiss chip-carved rosette decorates the center of the lid. This vibrant exotic (for Fairbanks!) tree was planted by a well-known local naturalist. Watco Danish oil finish, natural. 19"H x 19"W x 16"D; Scotch pine, black and white spruce, Alaskan birch; May 2010. 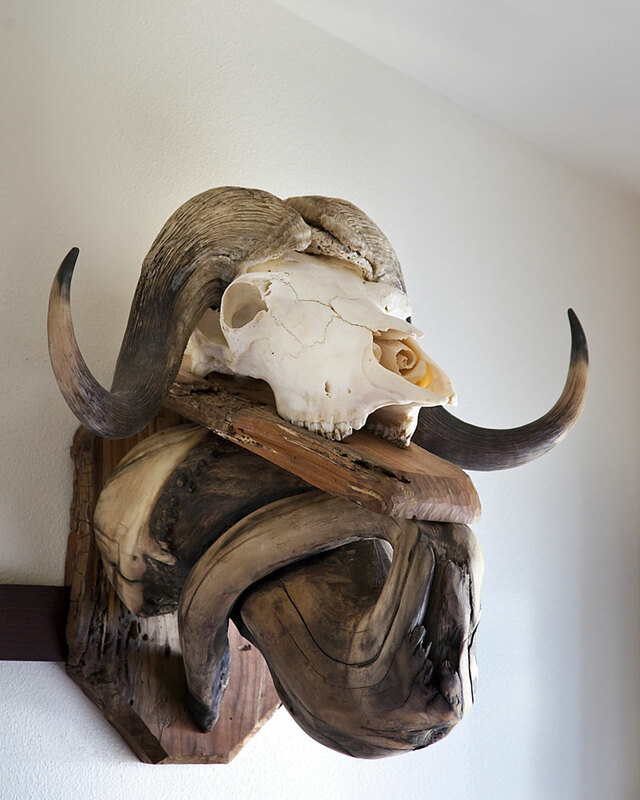 Musk-Ox Euro-Mount. Japanese cherry back and base boards; Tanana River spruce brace; 30"H x 16"W x 24"D; 3/2009. 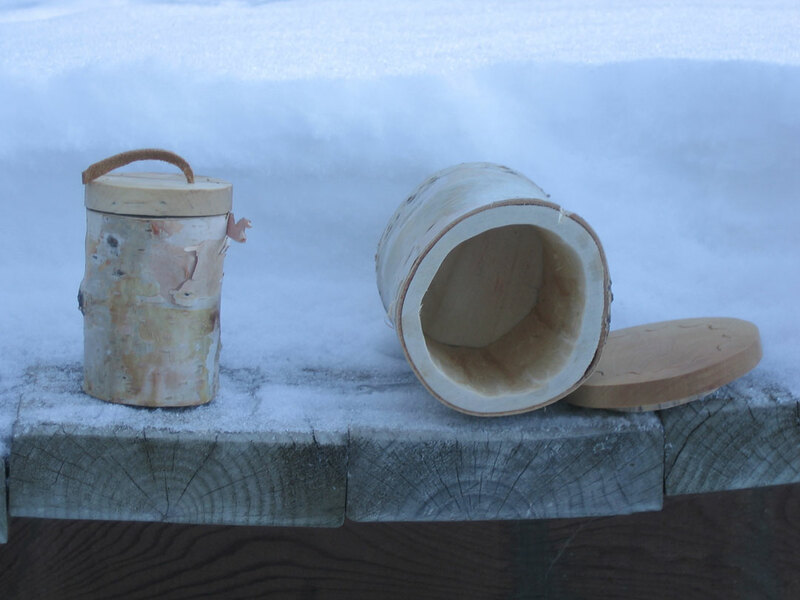 Traditional Norse shrink box (shown closed and open) in giant white spruce with folkstyle sliding lid. Allwood construction with black spruce burl and peg for lid fastener. Decorated with chipcarved Polish rosette and Swiss-style edge treatments. Black and white spruce, ply; 15”H x 15”Dia; 1/2009. PRICE: $175. 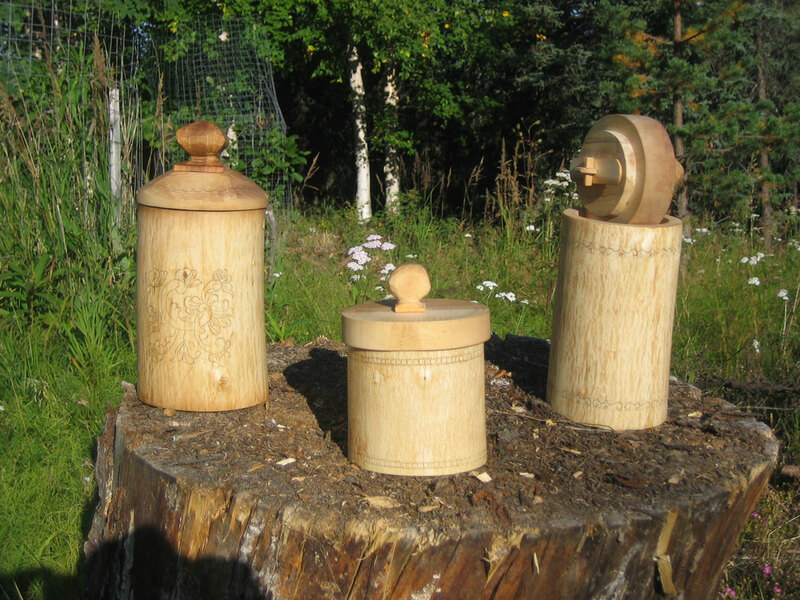 Norse-style, Alaskan birch shrink boxes with Swedish-style locking lid. Kolrosing (traditional Norwegian engraving enhanced with pigment and oil) border and floral designs. Alaskan birch, 6-9”H x 5-8 Dia; 9/2008. PRICE: $50-90. 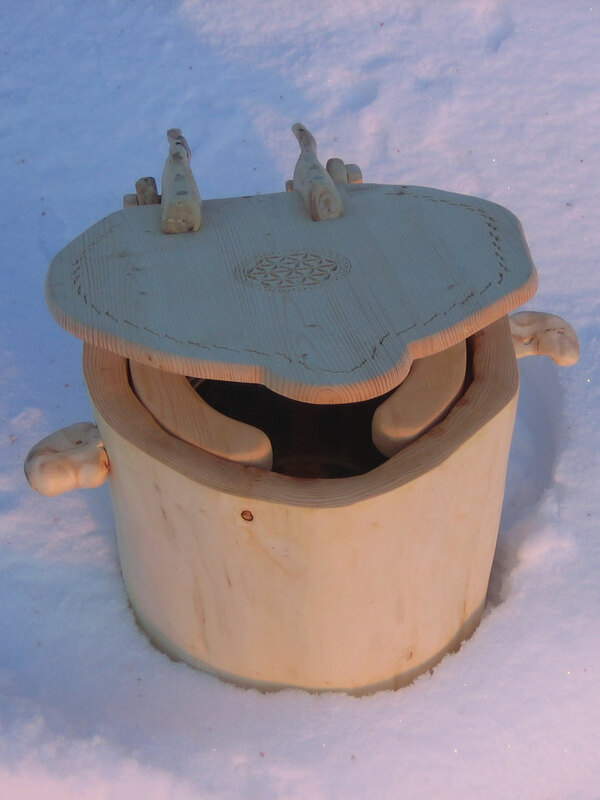 “The Portal”, giant white spruce trunk allows for traditional Scandinavian shrink box with custom seat and stainless steel bucket (latter not included; shown closed and open). 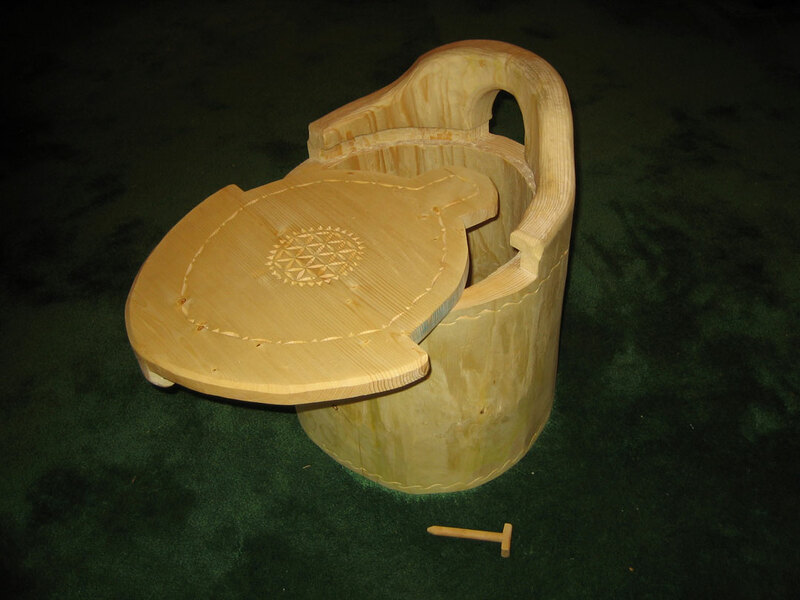 All-wood construction includes “lollipop” black spruce lower hinges and Y-branch spruce upper hinges (with built-in lid stays) pegged together; black spruce burl handles fit into mortises. Chipcarved Polish rosette and Ainu edge treatment. Black and white spruce, Alaskan birch, ply; 14”H x 16”Dia; 12/2008. PRICE: $250. Norsk-style Ale Bowl. Alaskan white spruce burl w/ carved flower decorations. White spruce; 16" l x 10" w x 7" d; 1/2008. 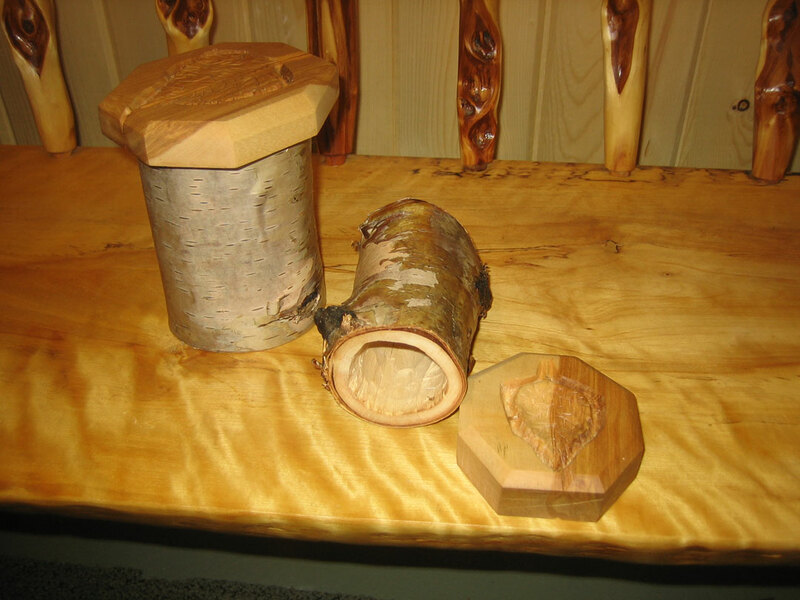 Norsk-style Birch Shrink Boxes. Green Alaskan birch is hollowed out, then a dry base plate is fitted to interior bottom and the cylinder is allowed to shrink onto the plate to hold in place. After complete drying, the lid is fitted to the top. 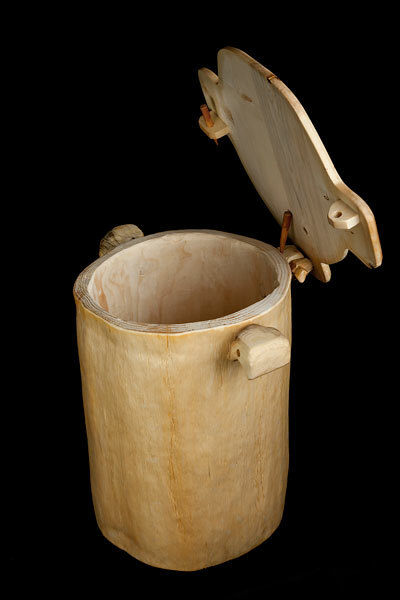 Alaskan aspen and birch and moose hide; 3" Dia x 4" h; 10/2007. 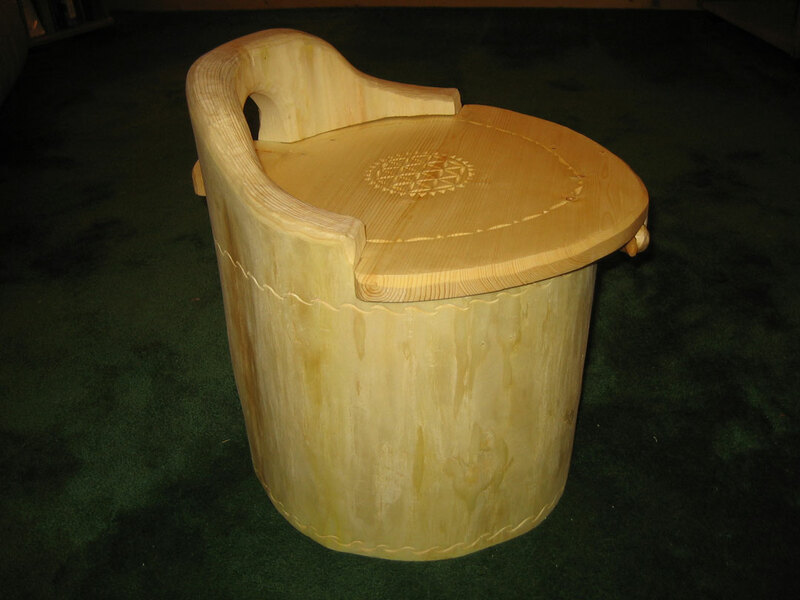 Octagonal Lid with Carved Birch Leaf on a Norsk-style Birch Shrink Box. Green Alaskan birch is hollowed out, then a dry base plate is fitted to interior bottom and the cylinder is allowed to shrink onto the plate to hold in place. After complete drying, the lid is fitted to the top. Alaskan aspen and birch; 3" Dia x 4" h; 10/2007. 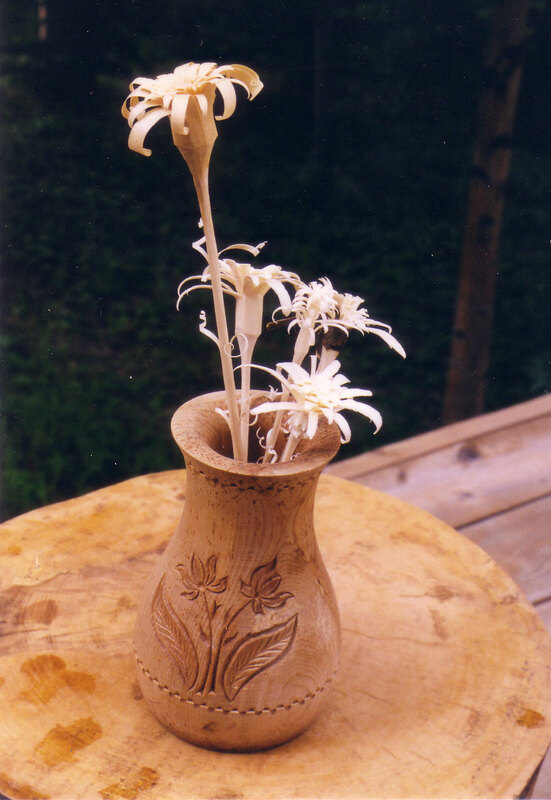 Alpine flowers carved from single blocks. Traditional throughout the Alps in Germany, Switzerland, Austria and Italy. 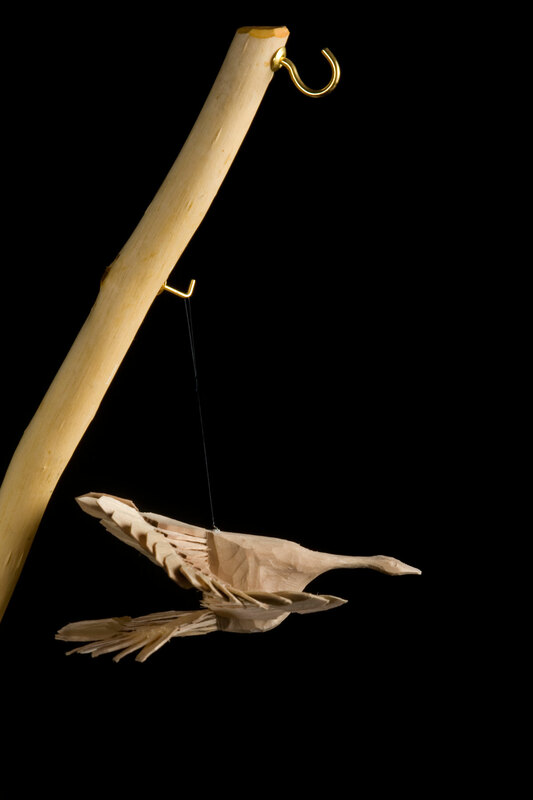 Black and white spruce and aspen, 11" l x 2" dia, 1991. 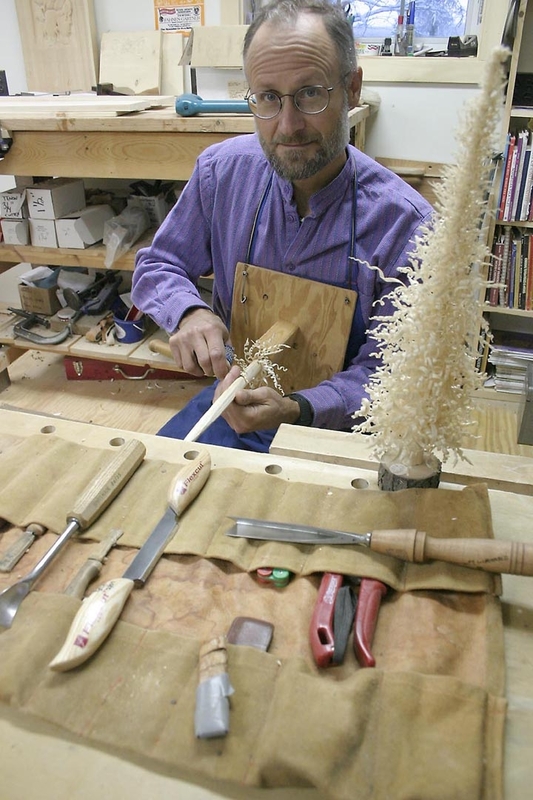 Philip Marshall in his studio carving a lastukassi or Finnish shaving tree in the manner developed by Kauko Rossi of Suonenjoki, Finland. It will be all one piece when finished. Aspen, 25 cm, 2005.